If there is one kriya to keep in your daily practice it is Sat Kriya. Sat Kriya is a complete kriya in one posture. It balances the lower chakras, getting deep into releasing entrenched patterns of fear, wounds of childhood, and psychologically damaging patterns. 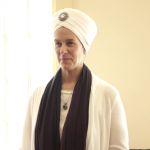 You can feel the meditative healing energy from this simple, yet powerful ‘everything’ kriya that is the major foundational kriya in the practice of Kundalini Yoga. Within this practice you can find your voice. It helps the brain and body recover from toxicity and balances and transforms sexual energy into meditative energy. It is best to start with 3 minutes and work your way up to a longer practice especially if you are new to Kundalini Yoga. 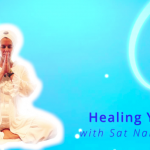 In our Sat Kriya Series we will feature videos of 3 minutes, 11 minutes, 22 and 31 minutes. 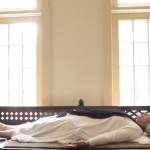 The rest period in this practice is part of the kriya and must be done for double the amount of the exercise for the benefits to be felt and the body to integrate the exercise. Sign up for a free membership to access our free videos and this introductory video to our Sat Kriya Series.